Hi friends: Here's another card using painted vellum and heat embossing. I used a pink card for my base and stamped the dot flowers background stamp repeatedly with Versamark Ink, then embossed it with clear embossing powder. 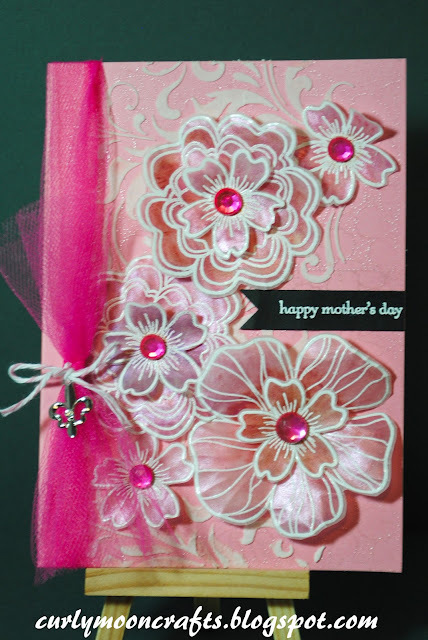 Next, I used the Flourish Layering stencil with embossing paste to create my "vine" behind the flowers. The Mother's Day sentiment stamp was stamped onto black cardstock with Versamark and embossed with white embossing powder. The various flowers were also stamped on vellum with Versamark and embossed with white embossing powder. I fussy-cut the flowers and painted them with Pearlescent Watercolors and layered them on the cardfront. The card is finished with some tulle, a charm tied on with twine, and some gems for the flower centers. Thanks for taking a look! Have a great day! gorgeous!! the vellum really shimmers :) thank you for playing along with us at simon says stamp wednesday challenge! Beautiful card! 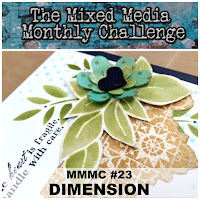 I love the dimension starting with the embossing paste and then your fussy cut flowers! Thank you so much for playing with us at The Mixed Media Monthly Challenge! You card is gorgeous! I love the technique you used on the vellum. Thank you for joining us at Craft Your Passion. We hope to see you again!